Geographically nearly Northeastern U.S. but considered Midwestern–and long ago western frontier!, Ohio is often, as is so much of the U.S. midsection, overlooked by those on the coasts (excepting, of course, that madness every four years known as “presidential campaign”). But it has produced its share of authors, from regional to well-known. Over the years, I’ve found myself compiling a mental list–the memoir of that local author, that prize-winner I’ve never gotten around to, this book on an Ohio historic event. I compiled the list, but I didn’t read from it. So now’s the time, the start. I’ve blogged about this thought, this loose plan, again and again, and now, now I’m finally starting. Reading Ohio. This will be a fun project, I think. And unlike other projects where I’ve posted lists then long-neglected, this one will have no posted list, but will be a focus for this blog, with breaks as whim or other plans dictate. It will encompass different genres and eras and a wide variety of authors–some of whom I hadn’t even heard of before I began this project, others who I’ve been meaning to get to for years. It already has pushed me into reading poetry, a type of writing I most usually avoid. I’m also hoping to add a few “field trips” into the mix; there are a few sites I can think of that will tie into this project. I’m defining “Ohioan” a little loosely. So many people move so frequently among the many U.S. states, both currently and historically, that there are few authors who have lived their entire lives in this state. 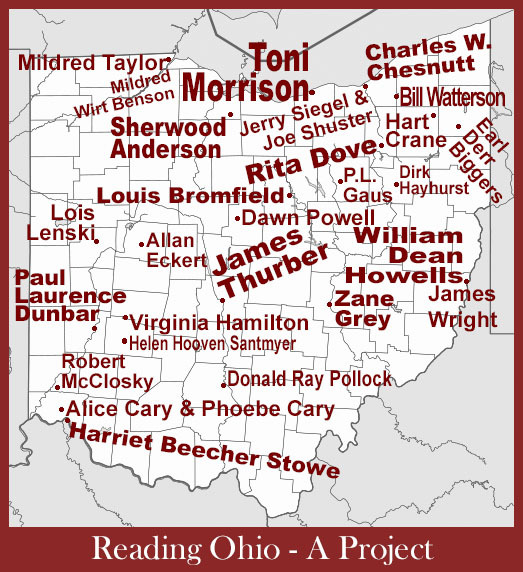 So I am looking at authors who spent a significant time of their lives here: growing up in Ohio, going to school here, living and working here for many years. When the whim strikes me I may even strike “significant” from the definition.